Staples’ Kyle Kirby (2) scores on a penalty shot during the FCIAC championship game against Darien on Thursday at Brien McMahon High School in Norwalk. 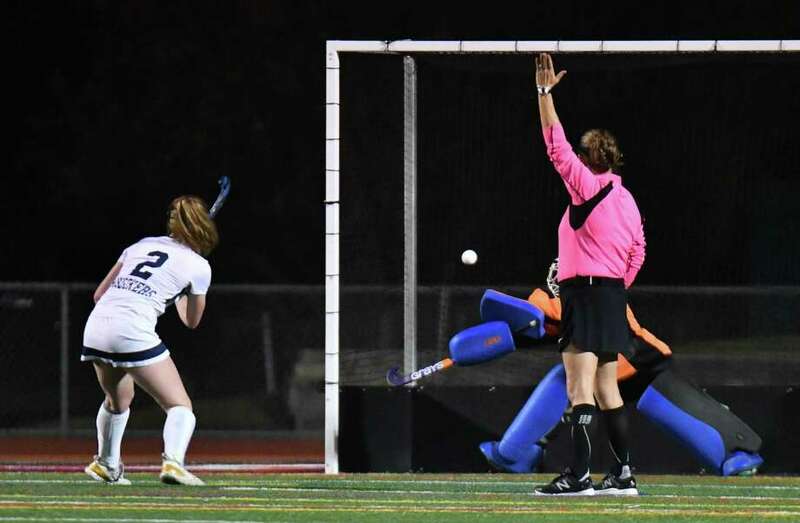 In recent years the Darien and Staples field hockey programs have had several memorable showdowns, scripting a new rivalry in a sport where historically the Blue Wave have had the edge with the Wreckers having closed the gap over the past couple of seasons. A new chapter was written Thursday night as the No. 2 Blue Wave re-established themselves as the best team in the conference, defending their FCIAC championship by knocking off the top-seeded Wreckers in a 2-1 thriller at Brien McMahon’s Jack Casagrande Field. After Staples took an early 1-0 lead when junior Kyle Kirby scored on a penalty stroke less than eight minutes into the contest, Darien’s Shea Van den Broek, who scored a hat trick in the semifinals against Greenwich, picked up right where she left off in the semis. The senior co-captain took a beautiful lead pass from senior Bridget Mahoney and fired a shot past Wreckers goalie Bridget Mulloy to even the game at one with 18:29 left in the first half. Staples had a great chance to break the tie early in the second half as Darien was issued a yellow card, giving the Wreckers a five-minute man-up advantage. The Wreckers, however, were unable to take advantage and shortly after getting back to even strength Darien scored the deciding goal. Junior Molly Hellman fired a shot toward the cage and as Staples attempted to clear, stole the ball and put it home off Mulloy, giving the Wave a 2-1 advantage with 19:47 left in the game. Staples had several opportunities off penalty corners as the game wound down, but solid defense from senior co-captain Katie Elders, senior Emily Schwartzman and junior Tala Garcia kept the Wreckers at bay until the final buzzer. With the win, Darien (15-2-1) took home its seventh conference crown in the past 10 years and avenged a 2-1 season opening loss to Staples back in September. Since starting off the season at 2-2, the Blue Wave have gone 13-0-1 and will enter the CIAC Class L playoffs as perhaps the hottest team in the state. The loss was the first of the year for Staples, who fell to 16-1 on the season. The two-time defending CIAC Class L champions will look to regroup for the state playoffs, set to begin next week with the first round scheduled for Wed., Nov. 7. Darien drew three penalty corners and had nine shots on goal. Junior goalie Catherine Vogt made one save in goal for the victors, who dominated the transition game led by sophomore Lindsey Olson, senior Lily Kulesz and sophomore Brinsley Rushe, who was named MVP. Mulloy made two saves in goal for the Wreckers, who had strong defensive efforts from senior co-captains Ellie Fair and Grace Cooper. Staples recorded four shots and seven penalty corners. Goals: D: Shea van den Broek, Molly Hellman; S: Kyle Kirby; Goalies: D — Catherine Vogt (1 save); S — Bridget Mulloy (2 saves).